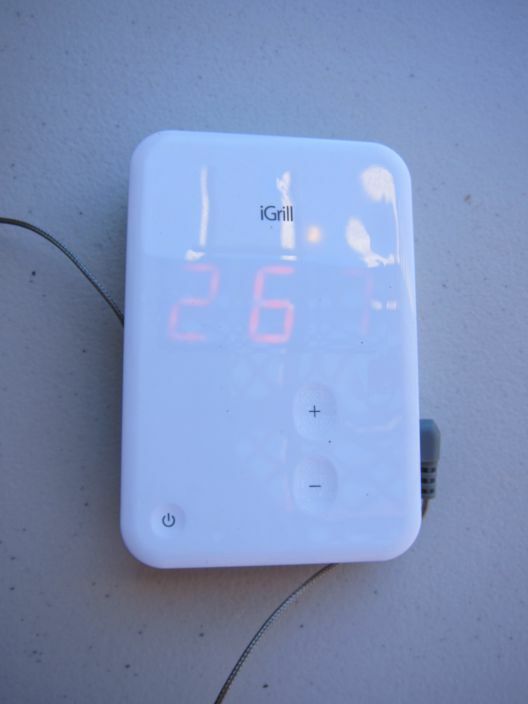 For this week’s review I was sent a white iGrill Cooking Thermometer from iDevices. 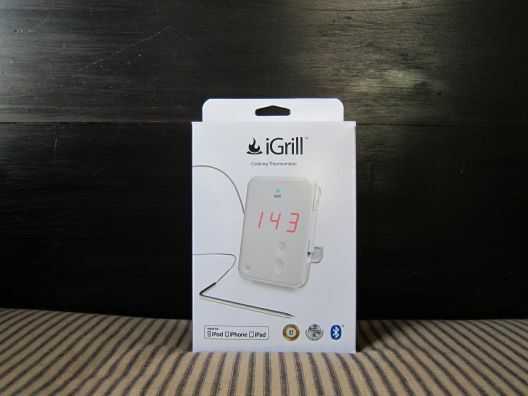 The iGrill is a cooking thermometer that connects to your iPod Touch, iPhone and iPad by Bluetooth connection. For this review I connected the iGrill to my iPad 2. 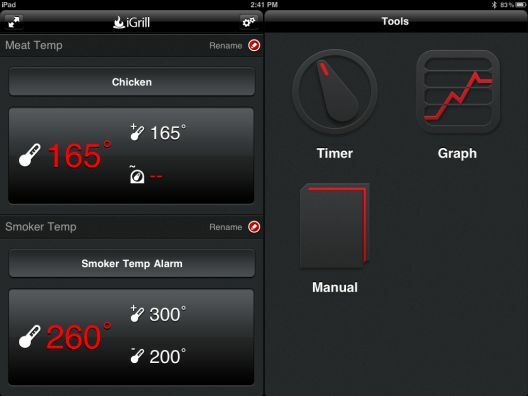 There are 2 apps for the iGrill that can be downloaded for free from the Apple App Store. The first app is named iGrill and the second app is iGrill Classic. I used the iGrill one for my review. After pairing the iGrill to my iPad 2 I opened the iGrill app and looked over all the available options. I really liked the user-friendly setup of the app. On the right side of the app was the Tools section which included the options of a timer, graph, and owners manual. The timer lets you set a countdown timer for your cook. The graph lets you keep track of your full cook and can be exported as a PDF or CSV format when you finish cooking. 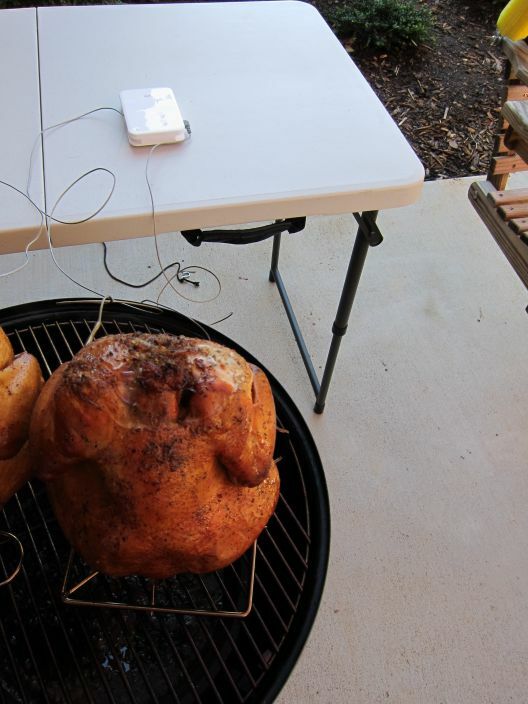 The graph also shows one or both probes that are connected to your iGrill and their temperature and your current time. The owners manual is a virtual version instead of a paper one. The left section of the iGrill app gives you the option of renaming whatever probes you are using for your cook. I used the top one for my meat probe and renamed it to Meat Temp. Directly below that is an option to pick which type of meat you are cooking and shows what the target internal temp should be when the meat is finished cooking and safe to eat. An alarm will also sound on your Apple Device when the meat reaches that pre-selected temp. At the bottom of the left section it gives you the option of using another meat probe or even an ambient temperature probe that allows you to monitor the temperature of the air in your grill or smoker. 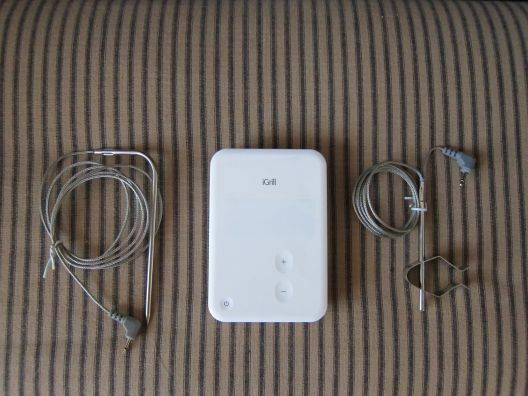 I ordered the ambient temperature probe from the iGrill website since the unit I was sent only included one meat probe. I set that probes high temperature alarm to 300 degrees and the low temperature alarm to 200 degrees. If the temperature of your grill or smoker goes above or below the temps you set, then an alarm will sound on your Apple Device. 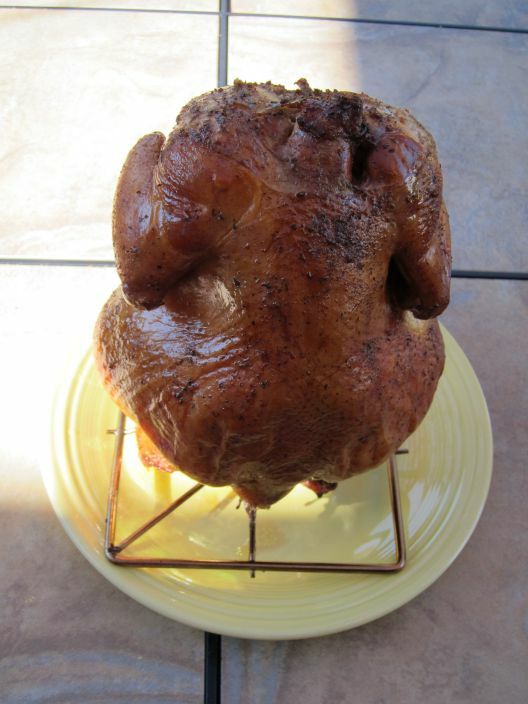 Once I had everything setup on the app and my 18.5 WSM was up to 250 degrees, I placed a beer can chicken on the smoker and inserted the meat probe into the chicken. 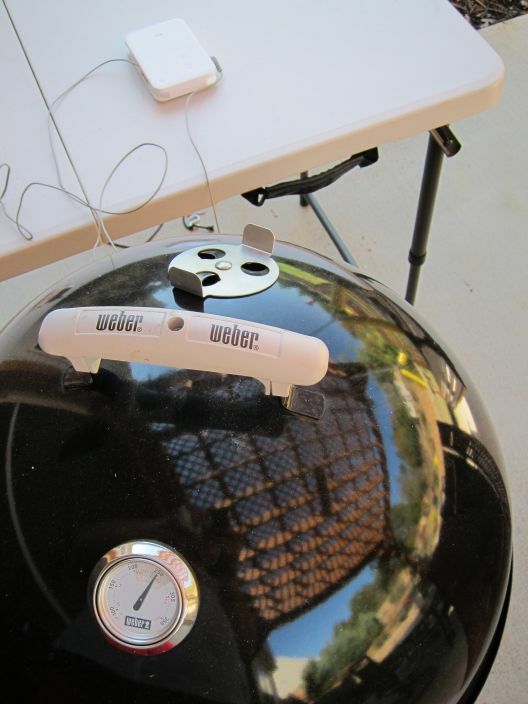 I also attached the ambient temperature probe with its included clip to the smoker grate. I then placed the iGrill on a table next to the smoker. As you can see in the picture below the iGrill has a touch sensitive interface that is easy to keep clean because there are no buttons or seams to gather dirt. The plus and minus symbols on the device are used to switch between the 2 probes. The iGrill can be set in a propped up, laying down or hanging position. The iGrill has a 200 foot+ range. I was able to take my iPad 2 throughout my entire house and never once lost connection between the two. The high temp alarm I had set went off a few times since it was a pretty windy day. I dismissed the alarm on my iPad 2 and went outside to adjust my vents on the smoker. When the alarm sounded that the chicken reached the internal temperature of 165 degrees I removed the meat probe from the chicken and brought it inside to eat. I was impressed with how simple the iGrill was to use. The app I used was easy to setup and I liked how you could monitor your entire cook on the graph. I also liked that I could set alarms to notify me if my smoker went above or below the temps I set and when the meat had reached its proper internal temperature. The iGrill is capable of tracking temperatures up to 400°F. I noticed on the box the iGrill came in that it’s American Made, so that was a big plus for me. Another great thing about the iGrill is that it works whether you pair it with your device or not. Just set your desired temperature and iGrill will beep when your food is ready. The last thing I would like to point out is the iGrill is not water resistant, but you can order what they call an iGrill Apron for it on the manufacturers website. The iGrill Apron is a one-of-a-kind silicone skin for your iGrill that will keep it safe from heat, moisture, food and the elements. You can find a great deal on the iGrill here . For more information on the iGrill please visit their Facebook & Twitter pages as well as their Website. ***Update*** iDevices has recently released the new iGrill2. You can find a great deal on the iGrill2 here. I actually saw these at Wal-Mart the other day in the electronics section. I will say it is the ONLY reason I would have an iPhone lol. They really, really need to make a Droid version. Thanks Shane! 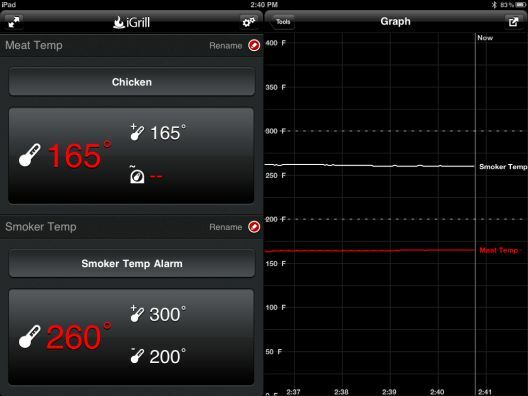 It looks like iGrill is working on an Android app for the iGrill. Here is a reply they posted to someone on their Facebook page. I really enjoyed using the iGrill. I do need to buy the iGrill Apron soon since we tend to get more rain here in SC then snow in the winter months. Thanks again for the comment Shane! Agree on comment about the need for an Android version! I would swipe one of those up in a heartbeat if it didn’t use iOS only. There is nothing like a grilling tool that gets the job done AND satisfies the geek inside. Thanks Dave! Its a fun and useful gadget…I only wish I had an iPhone to use with it. Sometimes it can be a pain to carry around the bigger iPad and an iPhone I could slip in my pocket. They are coming out with an Android app soon, so I hope I can get the app on my smaller kindle fire. Thanks again Dave and have a Merry Christmas and a Happy New Year! Was wondering if you thought a maverick pit temp. Probe would work with the iGrill? We’re you able to have the app run in the background during the cook? Hope I helped answer your questions Scotty. Thanks for leaving a comment! Any updates as to the release of the Android version? No new updates on that from what I’ve seen. I will make sure to update my review when they do end up releasing an Android App for it. Thanks for the question Mike! Looks like the Android app for the iGrill is in beta testing. Below is the message they posted on Facebook about it. Anyone want to be a beta tester for our Android app? Contact Livia at LiviaLiburdi@idevicesinc.com with your information and type of Android you own for more info! Alright, Galaxy S III!!! Good follow up, Jay. Thanks Mark! Now I hope they can make it so it’s compatible with my Nexus 7 tablet. 🙂 The new iPad mini that’s coming out will also be great to use with the iGrill. this is a very unigue item,with technology advancing so much and so many using an I-something I found this as a pretty awesome item and the dashboard is well set-up and easy to read…………..